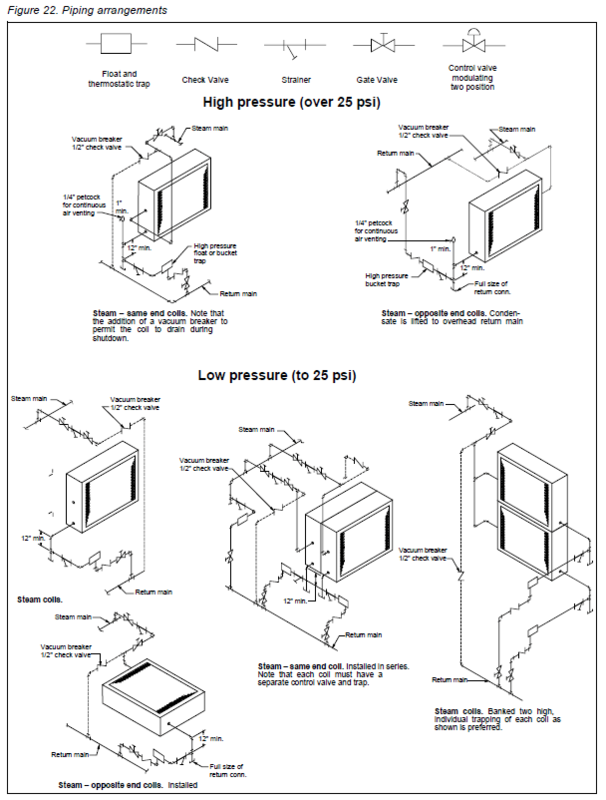 Most HVAC steam heating coils operate with steam pressure below 25 PSIG, and a very large percentage are below 15 PSIG. These coils have specific piping and coil arrangement requirements to allow these systems to optimize performance and avoid systematic problems that require premature replacement. Preheat coils in most of the country will require an arrangement that deals with below freezing air temperatures. In conjunction with low pressure steam, these coils must remove a large volume of condensate as quickly as it’s formed. This is the reason why the industry utilizes the tube-in-tube design. 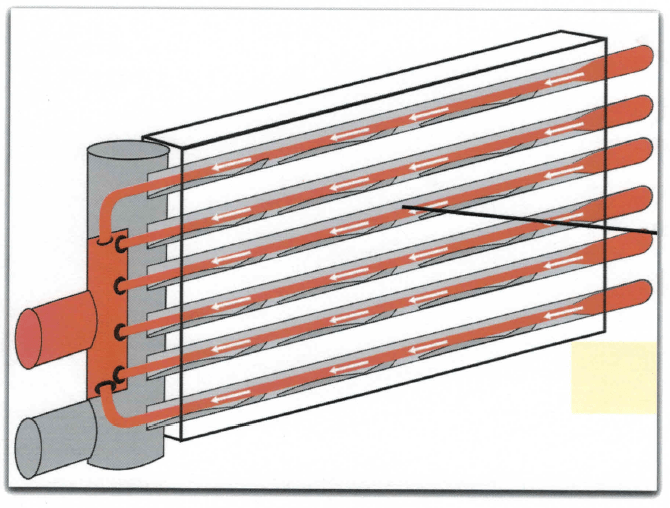 This means the coil has a separate path to distribute the entering steam through the inner tubes to the other end of the coil – opposite the coil connections. The inner tube has orifice holes all along the length of each tube that allows condensate formed from the heat exchange to migrate into the outer tube. The orifice also has a directional “hat” that projects the condensate back in the opposite direction towards the condensate return. Now free flowing steam is going in one direction while most of the liquid condensate is heading in the opposite direction. There are two types of steam distributing preheat coils in our industry. The first is the 5/8” OD type which has 3/8” OD inner distributing tubes. The second is the 1” OD type which has 5/8” OD inner distributing tubes. We always recommend the larger tube diameter coil (1” OD), because there’s more room in the inner tube to distribute the steam and more room in the outer tube to remove the condensate. A good quality coil should have the tubes pitched towards the condensate return. Preheat coils normally have their performance controlled by a “Modulating Control Valve” which is usually located in the steam line before the coil. These valves are sized for the maximum amount of steam required by the capacity of the coil. They also need to decrease the capacity by providing less steam. When the valve modulates, the inside of the coil can go into a negative pressure. Traps work on removing condensate in a coil with a positive pressure at the trap inlet. A vacuum breaker needs to be located between this valve and the inlet of the coil. Theoretically, this keeps the inside of the coil at no less than zero PSIG. It may not be positive, but it will never allow the coil to go negative. Traps must be located at least 12” below the coil outlet, and we recommend 18” below the coil outlet. Every 12” of leg below the condensate return is ½ lb. of positive pressure. 18” would be ¾ lb. of positive pressure. In conjunction with a working vacuum breaker on the steam line, theoretically this trap location should never have a negative pressure inside the coil and should be at least ½ lb. positive pressure. Traps need to be float and thermostatic type and must be sized to 3 to 4 times the condensate rate. The condensate rate is selected knowing the BTUH capacity of the coil and dividing the latent heat of the steam. It’s also very important that full size piping be run from the coil condensate outlet to the trap. You only reduce at the trap. Hot and cold spots on the coil face – can create a greatly reduced capacity. These hot and cold spots can also trigger freeze stat malfunctions. Steam hammer – which is steam colliding with standing condensate. You can hear the hammer in systems where the situation is severe. This problem can greatly reduce the life of a coil. Freeze event – standing condensate can freeze and destroy a tube in a matter of minutes. Condensate – by its very nature is corrosive. Standing condensate in a coil will allow rapid corrosion and can quickly destroy a coil. The proper selection of the coil and its steam accessories gives the installer the knowledge and confidence that the coil will have maximum performance capacity and a longer life. USA Coil & Air has all the arrangements of steam distributing coils. However, we also offer our SENTRY GUARD™ Burst Proof line of steam heating coils that will prevent damage from a freeze event. There are many systems where you can’t locate the trap below the coil outlet or have other problems that might cause these coils to go into a freeze event. SENTRY GUARD™ is your answer. Take advantage of our 40+ years of knowledge and experience to assist you in making the right selections. We solve problems for our customer – not create new ones.